Our Abpromise guarantee covers the use of ab174407 in the following tested applications. Defects in DLX3 are a cause of trichodentoosseous syndrome (TDO) [MIM:190320]. TDO is an autosomal dominant syndrome characterized by enamel hypoplasia and hypocalcification with associated strikingly curly hair. Defects in DLX3 are the cause of amelogenesis imperfecta type 4 (AI4) [MIM:104510]; also known as amelogenesis imperfecta hypomaturation-hypoplastic type with taurodontism. AI4 is an autosomal dominant defect of enamel formation associated with enlarged pulp chambers. 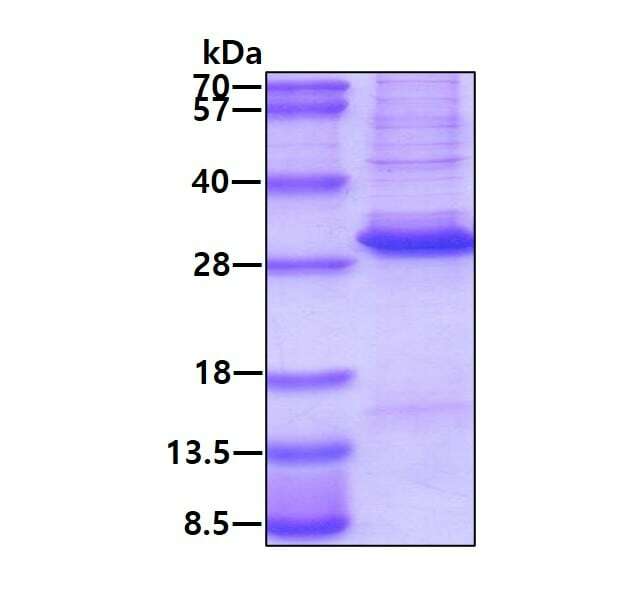 15% SDS-PAGE analysis of ab174407 at 3μg. ab174407 has not yet been referenced specifically in any publications. Publishing research using ab174407? Please let us know so that we can cite the reference in this datasheet. There are currently no Customer reviews or Questions for ab174407.